Sweeten up the holidays with these delicious instant pot dessert recipes! Some low-carb, some gluten free, some healthy, and some are just some real comfort food. You’re sure to find the PERFECT recipe for this holiday season. Disclaimer: affiliate links are used in this post which means I will receive a small commission if you purchase using my links. Read the full policy full of boring legal stuff here. I LOVE cooking with an instant pot as it makes everything so much easier – including baking desserts. If you’ve never tried baking desserts in one – I HIGHLY recommend you try it out! You will find a wonderful selection of instant pot desserts – some are healthy, some fruity, some low carb, and some are just the BEST comfort food! They all go great with these easy instant pot recipes, too! They are drool-worthy recipes that are the perfect for the holidays. These dishes will be ideal for an average sized family so be sure to adjust recipes accordingly if you’re making them for a large family holiday dinner! If you haven’t gotten your own instant pot yet, make sure to purchase an Instant Pot on Amazon and start making your life so much easier. For Black Friday, Walmart is selling my exact Instant Pot for $59.00. That’s almost 50% off! Target also has it own sale for $10 more but offering a $30 gift card on Black Friday. Already hooked on instant pot meals? Check out these awesome instant pot recipes and my favorite instant pot recipe book so you never run out of recipes for your instant pot! Now… onto the mouthwatering instant pot dessert recipes! Apple Crisp by the Typical Mom: This apple crisp recipe is so warm and sweet – made in under 10 minutes! It’s the perfect recipe everyone will love. Pumpkin Cheesecake by A Mom’s Impression: A rich and moist cheesecake recipe perfect for the holiday season that everyone is sure to love! Berry Cobbler by Easy Instant Recipes: This recipe is so sweet, fruity, and delicious that everyone will love – it’s easy to make too! Key Lime Pie by Living Sweet Moments: Key lime pie fans will LOVE this recipe – it’s so sweet, tangy, and delicious! Not to mention how easy it is to make for any party. Chocolate Chip Cake by Craft Create Cook: A delicious moist cake recipe with a hint of chocolatey goodness – one everyone is going to go crazy over! Keto Lemon Cheesecake by Two Sleevers: This healthier keto option is full of lemony goodness! Despite being low carb and keto-friendly, it’s quite delicious! Eggnog Bread Pudding by Sugar, Spice and Glitter: This drool-worthy bread pudding is a MUST for the holidays – so sweet, moist and delicious! Blueberry and Raspberry Compote by Simple Acres: For a delicious sweet addition to some vanilla ice cream – you MUST try this compote! It’s even a healthy recipe with antioxidants. It’s the perfect recipe for the holidays. 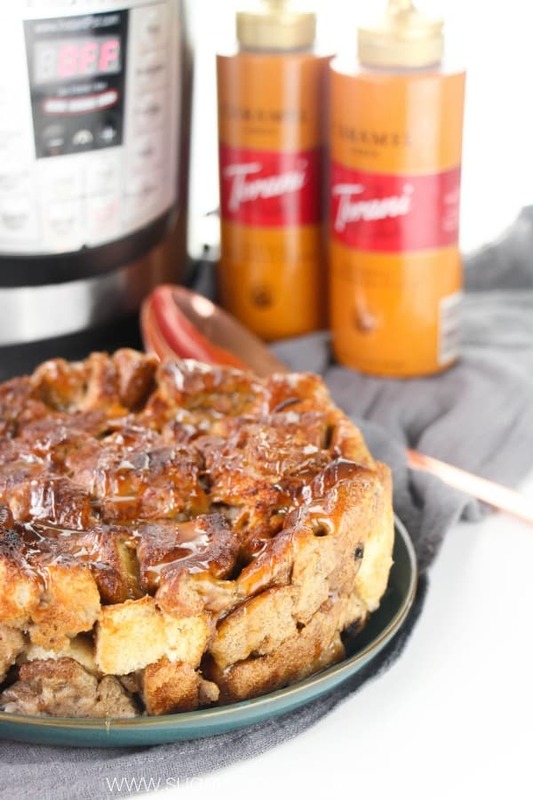 Monkey Bread by Princess Pinky Girl: The only thing better than monkey bread is an easy recipe in an instant pot! It’s so sweet and delicious – you’ll be begging your family to try it! Oreo Cheesecake by My Baking Addiction: Anything Oreo is drool-worthy, am I right? This cheesecake tops the cake with the delicious taste and easy recipe. You’ll be making this one well past the holiday season! Strawberry Cake by Sugar, Spice, and Glitter: This is the perfect dessert for the holiday season with its spongey texture and caramelized fruity taste. You will be having everyone begging you for the recipe! Apple Dumplings by Tastes of Lizzy T: This sweet apple taste matched with the flakey rolls makes a match made in heaven! In under 30 minutes, you’ll have the perfect holiday dessert. Orange Chocolate Cake by I Don’t Have Time for That! : Orange chocolate is such a delicious flavor combo and does not disappoint with this instant pot cake recipe! A true must for the holidays. Pumpkin Apple Cake by the Typical Mom: Pumpkin apple is one of my favorite flavor combinations and oh man this one is drool-worthy! PERFECT for this holiday season! Applesauce Cake by Easy Instant Recipes: Applesauce cake with candied pecans? YES PLEASE!! This is sure to be a delicious holiday dessert. Cinnamon Apples by Ginger Casa: I’m a huge sucker for cinnamon apples but usually don’t want to put forth the effort ha…. these cinnamon apples in the instant pot make for a delicious snack during the holidays and beyond! Brownies with Nuts by Wondermom Wannabe: These brownies are so ooey gooey delcious and easy! They are the PERFECT dessert for holiday family dinners. Caramel Popcorn by Clarks Condensed: This is the BEST snack for winter break – so sweet and savory and the ultimate movie night snack for the holidays. Coffee Cake by Awe Filled Homemaker: Coffee cake is such the perfect comfort dessert during the winter – and one of our favorites during the holidays! I love the fun twist on this recipe. Peach and Blueberry Parfait by Kalyn’s Kitchen: This is such a light, sweet, and refreshing treat. I love making these for breakfast during winter break but they also make a great healthy holiday dessert. Which of these instant pot dessert recipes would you like to try over the holidays? Share your thoughts by commenting below! Liked this post? Then check out more instant pot recipes: 19 Keto Instant Pot Recipes for Weight Loss!